Screaming and crying babies want to be comfortable and couldn’t care less what anyone thinks of them and their behavior. On the other hand, teens and pre-teens often seem to care only about how people perceive them. This worry about the opinions of others typically subsides in adulthood, but during the senior years it often disappears entirely. This greatly affects what the elderly say, do, and wear. The claim that “everyone who sees you in your Fan-Tastic caps will see that you’re the coolest ones around” is an amazing combination of defensiveness, condescension, and a lame pun. Equally unpersuasive is the way the crowd suddenly (and inexplicably) turns to the old couple and gives them patronizing thumbs up. 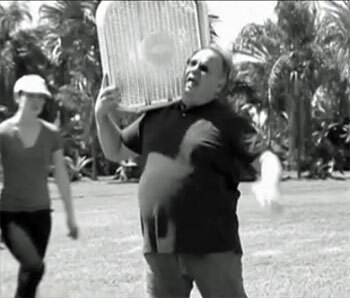 Though you may look like a dweeb, FanTastic will cool you down and its “gentle breeze will help keep bugs and mosquitoes away.” Unless, of course, you find yourself in an area heavily infested with insects; in that case the fan is more likely to chop up the bugs into bits and blow the remnants of their bodies into your face. This is something you never considered doing anywhere at any time in your life–and with Fan-Tastic you’ll never have to! Still, that couple shouldn’t snicker at that man. Because of the rising price of PBR, he turned to hard liquor. This greatly intensified his already severe alcoholism, which will now end only with his imminent death. 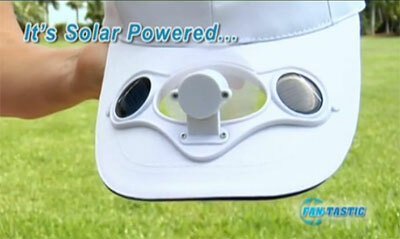 Ironically, the Fan-Tastic cap is poised to become the next fashion fad among urban hipsters. If you really want to be cool you’ll sit in the shade, but then your fan won’t quite work. Pure brilliance. I don’t know, if the alternative is this silly hat, I’d much rather haul around a box fan like that. Hell, the guy in the picture looks properly awesome and cool – like Johnny Rotten must have looked to the first Punks – for carrying it compared with the others, in a weird way. 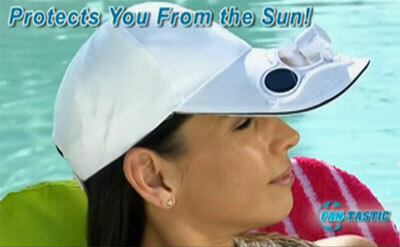 That brim is huge–i really think it would obscure your vision if you were trying to play tennis or golf or whatever. In the shot with the dad and his son fishing, it practically covers the kid’s whole face. The fan would be pathetically weak anyway, and “solar powered fan”, be it for your car or a dumb hat like this is BARELY noticeable.